Rudy: I’ve been putting off writing this review for a while, because I didn’t think it would be fair, but after my last review of Live Oak, I think I am ready. 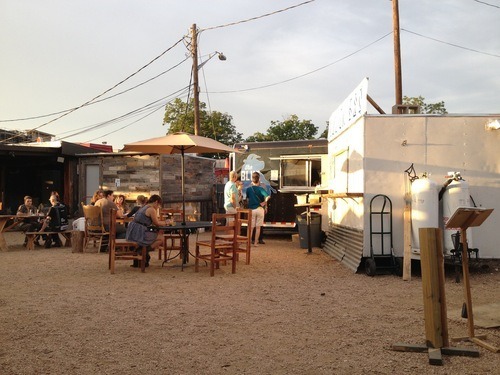 Blue Ox Barbecue is a new food truck that is located in the enclosed back yard of Buzz Mill Coffee off East Riverside in Austin. There have been lots of these barbecue food trucks popping up that are opening to great reviews. I’ve been trying to get to more of them, but the cold weather hasn’t made visiting a food truck a high priority (not sure the 100 degree summer will be any more appealing). 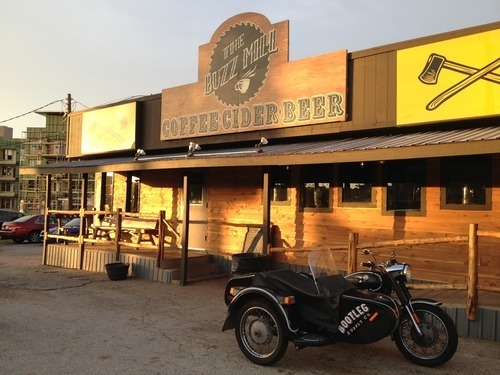 The enclosed yard that Blue Ox is located in has a small stage where live music can be played as well as plenty of picnic benches for seating and even what looked like a homemade skeeball game. Lots of personality, a fun atmosphere, and pet friendly. Unfortunately when I went to order, they had already sold out of everything but the pulled pork. This seems to be a recent theme that I have run into lately, where I’m arriving after most everything is gone. I’ll freely admit that I have purposely avoided ordering pulled pork in Texas because I’m afraid it is not going to be NC barbecue. But since I was already there, and I had no other options, I figured I would give it a go. And in a word, it was…fantastic! Rudy: Well, they never tried to make it NC pulled pork. 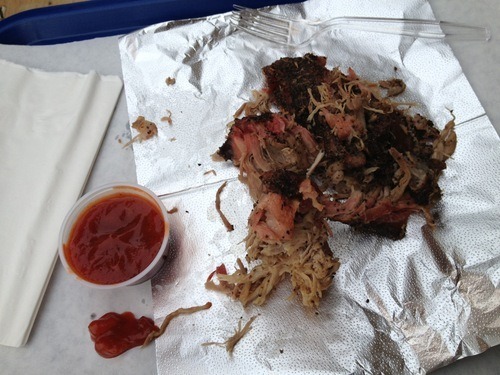 No, this was pulled pork Texas-style. The main staple of Texas barbecue is black pepper, and heavy doses of it. The outside of the meat has a bark that is built up and provides a tremendous amount of flavor in each bite. So, think NC pulled pork with a brisket bark, that’s what we were dealing with. They served it with a thicker tomato-based sauce which complimented it well, but wasn’t really needed because of the flavor of the seasoning. Monk: Alright, alright, alright…I’ve let this go on long enough. While the idea of pulled pork with a brisket-y bark sounds intriguing, let’s not get carried away here. It may be good, but it can’t compare to Lexington Barbecue (aka the gold standard) can it? Rudy: I have hesitancy with saying it, so I know you don’t want to hear it. Maybe being away from NC for a while has made me forget some of the gloriousness that is Lexington Barbecue. I definitely need to have it again before I could think of saying that, which leads me to my ratings. I have to give Blue Ox an incomplete, because I only had the pulled pork and wasn’t able to try everything (or at least as much as I wanted). But it was a very fortunate occurrence, because if they hadn’t been sold out of everything else, I never would have tried the pulled pork. Unlike Live Oak, where I felt confident giving it a rating, because I was also confident that I didn’t want to go back, I am giving Blue Ox an incomplete until I can return, which I hope to do shortly.